I love Pixar movies. Pixar has never made a movie that has even come close to disappointing me. They’re consistently funny, dramatic, beautiful, and even a little geeky if you know some behind-the-scenes stuff. 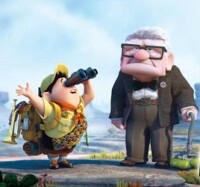 Given my penchant for their movies, I was excited to see UP. I planned it so my daughter and I could go see it in 3D on opening night at the best theater in our area. We showed up an hour early just to make sure we could get tickets and get a good seat dead smack in the center of the screen. It wasn’t nearly as crowded as I’d expected, so we had no trouble at all… perfect seats. Two rows behind me, sitting slightly to the left, was a woman who evidently lives in her own self-centered, egotistical bubble of inconsideration and, in an almost conversational volume, kept up an inane, non-stop commentary of the movie’s events to her child, stopping only to indignantly shush him when he made any comments or noises of his own. I’m very non-confrontational, so for a long time, I sat there and tried to ignore her. At one point, I got frustrated enough that I turned around and looked at her, displaying the universally accepted “shut the hell up” expression. Sadly, we all had the 3D glasses on, so the laser-focused, burning heat of my baleful glare didn’t have its fully intended effect. A short while later, I took a page from her own playbook and turned around and shushed her. Sadly, the shush had a lasting effect of about 60 seconds. In retrospect, there’s a good chance she thought I was shushing her son. I think she was completely unaware of the extreme obnoxiousness of her behavior. I really should have turned around and said something like, “Lady, would you please knock off the running commentary so the rest of us can enjoy the movie.” I probably would have gotten applause from the people sitting around me. As it was, it took a lot away from the movie for both me and my daughter. I still loved the movie, though, which is a testament to Pixar’s genius, and I love going to real movie theaters. I really think, however, that it’s not the high prices of movie tickets, popcorn and drinks that will lead to the demise of theaters. It’s inconsiderate, rude, obnoxious, graceless, ignorant people (like the clueless harpy I encountered) that will bring them down. Next time, I’ll speak up. I’ve been known to turn around and say, “Excuse me, but we are NOT in your living room!” While Dave sinks lower and lower into his seat, of course. This happened to us for the Lord of the Rings. Running commentary from a 7 year old, who loved the waterfalls, I can report, but was scared through most of the movie. And then the cellphone calls being answered…. And that was the last movie we bothered to go to the theater for. I’ll wait for them to get to Netflix, thank you very much. When did people get so rude and obnoxious, so self absorbed and unbearably narcissistic? She probably would have gotten even louder if you HAD spoken up to her. How DARE you shush her! She would have been indignant. That happened to us when we went to see Con Air. A guy had a toddler with him who was crying and yelling. We said something to him and he tried to get my husband to go out and fight him in the parking lot. Now that’s class! Fighting in front of your 2 year old because you’re so sure you’re right, to let him cry for 2 hours in a rated R movie! ARGH! I think the fear of her getting worse may have been a factor in addition to my non-confrontational’ness. I still love going to the actual theater, though. If that sort of thing starts happening on a regular basis, I’d stop going, but fortunately it seems to be relatively rare in my area. I get bag rustlers more often than talkers. I can handle that a lot better, but it’s still pretty rude. The people who do it seem to be oblivious. I think I may have to use my sister’s line of “we are NOT in your living room” one of these times and see how that works out. Ha! I can’t believe a guy brought his 2-year-old to Con Air! That’s right up there with one time where two friends and I went to see Blade 2, which was just super-gory and violent… and there was some lady with a kid who couldn’t have been over 5 sitting near the front. That’s just nuts.